The simplest speech sound elements that are used to differentiate between one word and another are known as phonemes. 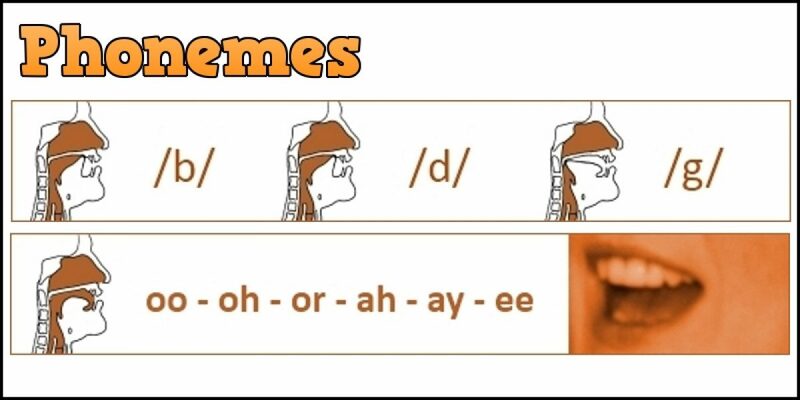 A phoneme is considered to be the basic unit of speech in much the same way that a morpheme is considered to be the basic unit of language. Speech sounds are considered to be phonemes if they can be substituted in words with another speech sound which then alters the meaning of the word. As an example, consider the word bin. The initial consonant ‘b’ may be substituted by the consonant ‘t’ to form the new word tin. The meaning of the word bin now contrasts with the meaning of the new word tin – and it is the initial consonant that achieves this distinction. A phoneme, therefore, is a speech sound that exhibit this contrastive function. To summarise: both ‘b’ and ‘t’ are considered to be English phonemes because they are capable of contrasting meanings (e.g. ban is not the same as tan; bag is not the same as tag; big is not the same as tig, and so on). By a similar argument to the one above, we can see that vowels may also act as phonemes. Consider the word bass. It is not possible to know how one should pronounce this when simply reading it on its own. There do, however, appear to be at least two possible ways of saying this word, depending upon its meaning, e.g. The word bass is actually made up of three speech sounds: two consonants – ‘b’ at the beginning and ‘s’ at the end – with a vowel sandwiched in between. As the only distinction between the two meanings of the word we are discussing here (fish or musical instrument) is in which particular vowel is used, then we must also recognize vowels as separate phonemes. This is because these vowels can similarly be substituted in a word by other vowels and, thereby, alter its meaning. So, any speech sound (whether a consonant or a vowel) which is capable of creating distinctions in meaning is said to be a phoneme. All phonemes, therefore, function contrastively. In British English there are around 44 phonemes (24 consonants, and 20 vowels). Phonemes themselves may have slight variations in the way they are articulated. These variations are usually not sufficient to create distinctions in meaning, however. Such variations are called allophones.